Roof Rafters: Plywood or Oriented Strand Board? You are here: Home / Blog / Roofing / Roof Rafters: Plywood or Oriented Strand Board? All roofs are framed with either rafters or trusses. Rafters run from the peak of the roof to the eaves, while trusses are rafters joined by an internal brace. Regardless of what frames the roof, the frame has to be covered with a sheathing or deck before any of the main roof components can be installed. The two most popular sheathing options are plywood and oriented strand board (OSB). 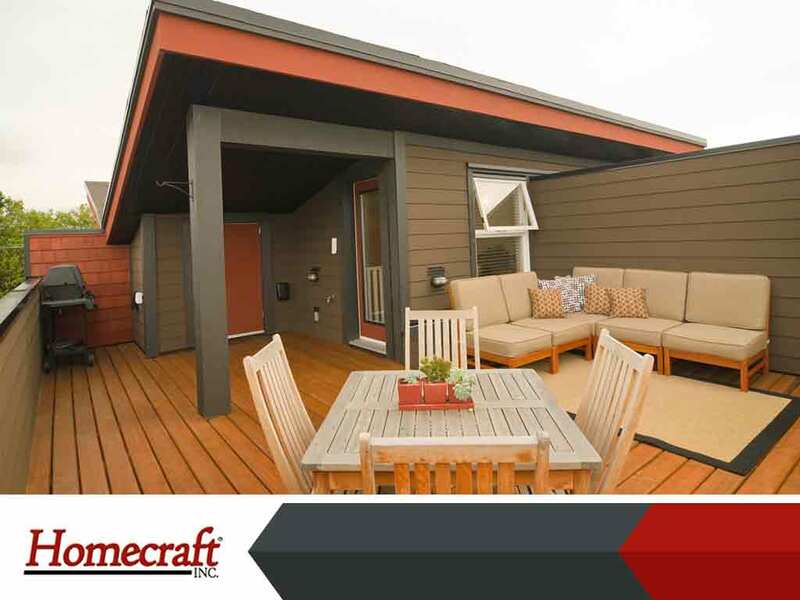 Homecraft®, Inc., your roof and siding contractor, discusses how to choose between these two materials for the roof rafters. Plywood lost its market leadership to oriented strand board a long time ago, as OSB is more cost-effective. Still, this doesn’t make plywood an inferior material for sheathing. In fact, there are certain aspects of plywood that are more attractive. One of the biggest differences between plywood and OSB as sheathing material is how they react to wood. When plywood gets wet, it tends to swell consistently across the sheet, and then returns to its normal dimensions as it dries out. It also dries out faster than OSB, which means the swelling won’t affect the roof finishes that much. This innate water resistance is what makes plywood a great choice for homes that are prone to chronic leaks. It’s also used as a siding material due to how consistent it swells as it gets wet. OSB has key strengths that make it a reliable sheathing material and a good alternative to plywood in some cases. This material has a more consistent density. To compare, plywood sheathing can range from 5 to 7 plies thick. OSB, on the other hand, is made from as many as 50 strand layers packed and compressed into the same thickness. Thanks to its consistent density, OSB sheathing doesn’t have weak spots that are common in plywood when knotholes in adjacent plies overlap. The only downside to OSB, other than it doesn’t dry out quickly, is that it’s heavier than plywood. It requires more effort to install but doesn’t have any effect on its performance as a sheathing or panel material. At Homecraft®, Inc., we will help you weigh the pros and cons of these two sheathing materials so you get the most appropriate sheathing for your roof rafters. We also install vinyl siding. Call Homecraft, Inc. today at (877) 494-0377 to learn more about our products and services. We believe in rendering quality work for our customers while adhering to our values of honesty, reliability and integrity. We are a roof and siding contractor in Hockessin and Wilmington, DE.